What size window AC unit do I need? Where should I install my window air conditioner? What are the benefits of a window AC? Can I install the window air conditioner myself? How do I clean and maintain the air conditioner? Can I leave a window air conditioner unit installed during the winter? Will energy star rated models save money? Window air conditioners are one of the most popular and effective ways to cool down. But, with so many options and sizes on the market, how do you know which one is right for you? Here, we have everything you need to know about purchasing and maintaining a window air conditioner. We have complied a list of our customer’s most frequently asked questions and had our experts answer them for you! If you have any questions that you don’t see listed here, please leave us a comment down below. 1. What size window AC unit do I need? 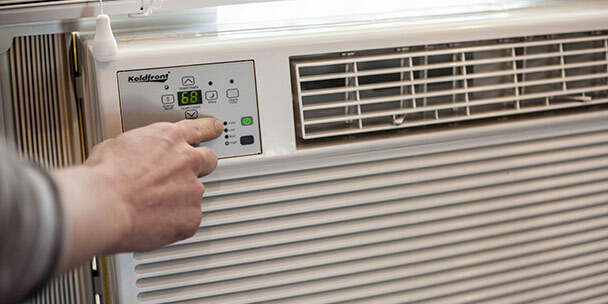 Purchasing a properly sized air conditioner is the first step, and is essential to ensuring the unit works effectively and efficiently. This is why it’s vital to do your research and figure out which size window air conditioner is best for your space. Buying a unit that is too large will waste energy and buying a unit that is too small will not cool down the temperature. You’ll need to figure out the square footage of the room. Most rooms can be divided into two basic shapes–square/rectangle and triangle. For square/rectangle rooms, multiply the length of the area by the width to figure out the square footage. For triangular shaped rooms, multiply the length of the area by the width then divide by two to get the square footage. Ceiling Height — Most calculations and charts assume the ceilings are 8 feet high. If they are taller, you’ll want to purchase a higher BTU window air conditioner. Room temperature — In heavily shaded rooms, the capacity should be reduced by 10 percent, and for very sunny rooms, capacity should be increased by 10 percent. Occupancy — If more than two people regularly occupy the room, add 600 BTUS for each additional person. Kitchen — Since kitchens tend to get warmer than other rooms, increase the capacity by 4,000 BTUs. 2. Where should I install my window air conditioner? Window air conditioners are designed to fit inside double hung windows. Be sure to measure the inside of the installation window before purchasing. Most window air conditioners come with a kit that includes everything you’ll need for installation. Placement of the window air conditioner is also important. Installing it in a shaded window will help extend the life of the unit. A window that faces north will have the most shade. The area should also be properly equipped with an outlet. 3. What are the benefits of a window AC? Cost–Window air conditioners are affordable! They’re available in price ranges from $200-$900. Not only do they cost less to purchase, they are energy efficient and won’t run up your utility bills. Easy Installation–They do not require a professional HVAC for installation. It can be done with two people in a short period of time. Window air conditioners don’t require any major structural changes to your space. 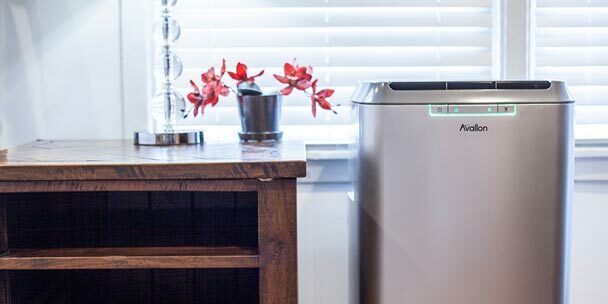 Portability–Since the installation process is so simple, if you move homes, apartments or offices, you can take the window air conditioner with you. There is also the option to move it to another room in the home. Supplemental Cooling–If there is a hotspot that the AC doesn’t cool down enough, a window air conditioner is a great option. Especially in bedrooms during the height of summer, adding a window unit can be a simple and effective solution. 4. Can I install the window air conditioner myself? Yes, easy installation is one of the many benefits of a window air conditioner. Once you’ve chosen the location and confirmed that the dimensions are correct, the unit can be installed in no time at all! If your window air conditioner comes with install brackets, it’s important to refer to the owner’s manual for instructions. Open the window and carefully place the unit inside. Reference the owner’s manual for any specific instructions on proper ways to angle the unit to help drain any condensation. Next, expand the accordion panels outward to reach the edge of the window and screw them into the bottom sash. It’s important to prevent the window sash from shifting, which can be secured with “L” shaped brackets that may have been included. Finally, you will use the weather stripping kit to insulate the window. If the kit wasn’t included, it can be purchased at a local hardware store. If you live in area with a lot of rain or wind, it is recommended to caulk the outside of the unit as well. Further detailed instructions on how to install a window air conditioner can be found here. 5. How do I clean and maintain the air conditioner? Cleaning and maintaining a window air conditioner is fairly simple. During peak season, it’s recommended to clean the filter once a month. A washable filter can be rinsed with water and mild detergent then left out to air dry. For disposable filters, it is recommended that you purchase and replace it every two months. The evaporator coils and the coils on the back of the unit should be inspected for dust and debris build up. If they are dirty, you can use the brush attachment on the vacuum to give it a quick cleaning. Once you are putting the window air conditioner away for the season, the coils can use a deeper cleaning by applying a natural cleaner, rinsing off and allowing to air dry. Please note, the window air conditioner must be unplugged before performing any cleaning or maintenance. Thorough step by step instructions can be found here: Maintaining Your Window Air Conditioner. 6. Can I leave a window air conditioner unit installed during the winter? Each model is different, so we recommend checking the owner’s manual to see if the unit is able to withstand low temperatures. Some window air conditioners also have a dual heat function, so it’s important that it remains installed to add supplemental heating in the winter months. If you do plan to leave the window air conditioner installed, be sure to take certain measures to prevent moisture from getting inside the unit by covering it with a durable plastic cover. It’s also important to have weather strips that are properly installed so the cold air doesn’t seep in and the warm air doesn’t escape. 7. Will energy star rated models save money? Yes! Energy Star models will save approximately 30% on your utility costs. Because of strict energy efficiency guidelines, Energy Star rated models will operate more resourcefully and consume less energy over the lifetime of the unit. my a/c gets mold and dirt. can I clean from the outside of the unite with a spary bottle with b.leach? Can I install 18000 unit in window and later move to a in wall space? Do I need to install my unit in a window? Can i just us it in the room without placing it in the window? Why is it not flowing down toward the drain hole in the back? I have a wall unit heat/air conditioner that did not have a booklet included with it. Now the “check filter” light went on & I did do that but can’t get that light off. Can you please let me know how to do that! I need a window ac for an upstairs bedroom. But need the quietest one possible. So many ac’s don’t give the decibel level. Do you know where I can find this info. ?